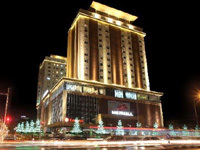 Ramada hotel is one of the best hotels in Ulaanbaatar. It started to run its activities in 2011. There are 128 rooms with several of types such as Standard, Deluxe, Executive Suite, and Suite in the hotel. All of the rooms are equipped properly. The hotel serves a complimentary breakfast, and provides with free newspapers daily and wireless, high-speed Internet access. Facilities include Asian and European restaurant, business center, international telephone possible, conference room, sauna and shopping mall. We offer a conference hall of boardroom style and a business center with 24-hour copy, fax and print services, plus free PC and high-speed Internet access. The Blue Sky Hotel and Tower is an elegant luxury hotel with 200 spacious and exquisite designed guestrooms. It has complete fine restaurants presenting delectable Western and Asian cuisines. The location of the hotel is perfect because it is located at the hearth of Ulaanbaatar’s bustling shopping and business district commanding spectacular views. Facilities of the hotel include conference room, internet, business center, fitness club, swimming pool and sauna. 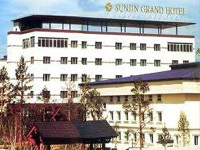 The Sunjin Grand Hotel is a comprehensive hotel with113 guest rooms, including 23 deluxe rooms, 11 deluxe suites and 1 presidential suite, equipped with everything you need. The hotel has Harry’s Pub and Bar and Restaurant Pharos of Asian-European, Korean food restaurant, etc. In addition, there is a sauna, massage, fitness center, Internet, business center, souvenir shops, as well as karaoke. It has a good reputation in facilities that sense of comfort. 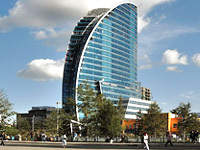 Chinggis Khaan Hotel was built in 1996, in a four-star hotel of Mongolia’s first luxury hotel International Convention Center, and international event takes place. It is located at 20 km from Chinggis Khaan International Airport. The hotel has 190 guest rooms with air conditioner, wireless high-speed Internet access, cable TV, telephone, mini bar, 24 hour room service. Excellent Asian, European, North-American meals are available in its restaurant and there is buffet breakfast service. There is a facility exchange services, DHL international post services, cashmere shops, international telephone service, business center and free internet corner, fitness center, sauna, massage, swimming pool, beauty salon, karaoke and night bar, etc. Chinggis Khaan hotel has one of the biggest conference halls in town which accommodates 200 people at once. Business centre offers extensive business opportunities and excellent facilities. 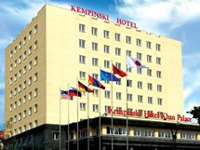 Kempinski Hotel Khan Palace is a contemporary luxury hotel of Ulaanbaatar. It is 20km away from the “Chinggis Khaan” international airport. Its 102 elegant and spacious rooms and suites have hosted royalty, dignitaries and celebrities visiting Mongolia. The hotel offers a fully equipped business centre as well as conference and meeting rooms for 200 participants. The hotel has good facilities such as Asian and European restaurant, souvenir shop, business services, international telephone, internet connection, sauna, massage, and a fitness facility. The Palace Hotel has 88 comfortable guest rooms and offers you modern style hotel and restaurant service, traditional Mongolian authentic hospitality. It takes 15 minutes to reach to the “Chinggis Khaan” international airport and 10 minutes to the “Ulaanbaatar “ railway station. 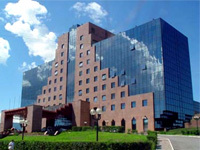 The hotel has business center, conference hall for 250 guests and meeting rooms. There is a health club where you can get service for beauty and health. Its Finland sauna with Japanese style bath, qualified rubbing and massage service, beauty salon and fitness room are at your disposal. Massage in guests rooms are arranged by appointment. 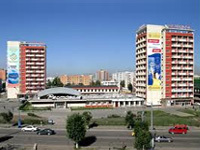 Bayangol Hotel has been operating its activities since 1964. It always plays a significant role in the Mongolian tourism and hospitality industry. It is 17 kilometer from “Chinggis Khaan” international airport and 2 kilometer from “Ulaanbaatar” railway station. The hotel has 215 well-furnished guest rooms with 400 beds that is currently the biggest hotel in Ulaanbaatar and has the capacity to cater for 500 guests in its restaurant, which is currently the largest in the city. All rooms have Wi-Fi Internet Access and cable television with 45 international and local channels. 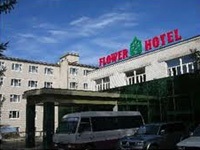 Flower hotel is first major foreign Japanese-Mongolian joint venture hotel in Mongolia. It started its operation in 1995. The hotel has 180 guest rooms with 330 beds, complete with fine restaurants: Altai restaurant /Mongolian and European cuisine/, Fuji /Japanese restaurant/ and Hana /Chinese restaurant/. 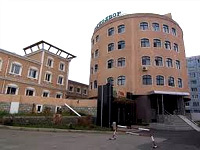 The hotel is 20 kilometers from the Chinggis Khaan International Airport and 6 kilometers from railway station. Fully equipped conference hall can accommodate up to 60 people at once. Lion Hotel is a small beautiful hotel with 25 guest rooms equipped with all necessary furniture and accessories for excellent relaxing and working environment. Each room has IDD telephone, cable TV with international and domestic channels, internet and fax line. Mongolian, Asian and European cuisines are served in the restaurant, which has capacity to receive 60 guests at once. 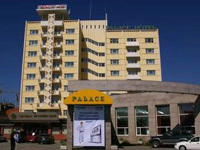 The hotel is located just few minutes short walk to Ulaanbaatar railway station. Therefore, it is available for travelers who visit in Mongolia shortly. Gobi Complex was built in 2005, included a hotel, kids island, spa, sauna for relaxing with internet, business center, Korean and Mongolian restaurant. 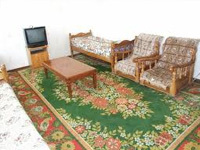 Gobi Hotel is a premium business hotel for both tourists and business people. It takes 20 minutes to reach the hotel from “Chinggis Khaan” international airport.